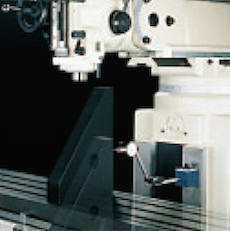 Willis conventional knee mills have served many industries, including job shops, aerospace, the energy industry, and many others, with their high precision and extremely durable construction for many years. Available in many configurations (i.e. with dovetail or box ways, 3HP or 5HP spindle motor(s), and R8, 30, or 40 taper spindles), the Willis conventional knee mills will meet the demands of virtually all conventional knee mill demands. NRTL approved machines available upon request. 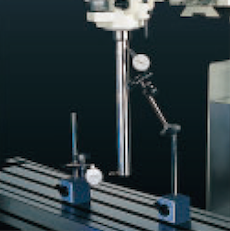 “Willis Machinery” offers five different models of vertical knee mills, both conventional and CNC. 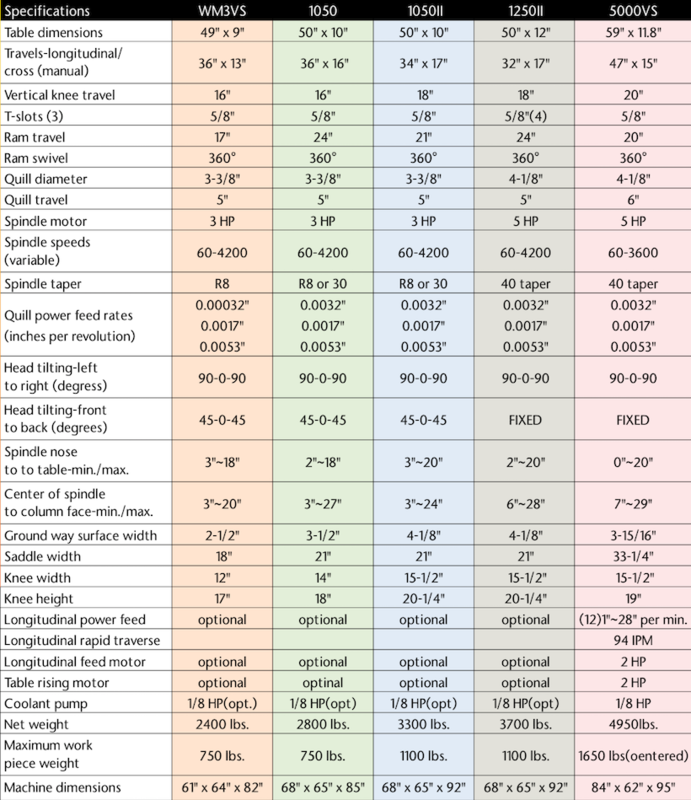 Our mill machines range from the model WM3VS, 3 horsepower (3HP) variable speed, R-8 spindle mill machine with a 9 inch x 49 inch table, to a massive 5 horsepower (5HP), 40 taper spindle, Series II style machine with a 12 inch x 59 inch table providing 47 inches of x-axis travel. 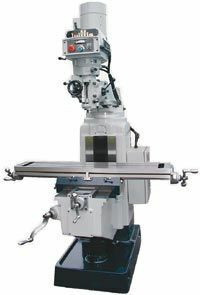 Our 5000VS model has 5HP variable speed 60-3600 RMP, 40 taper spindle. It has a hardened ground table surface with built in tool trays on either side, with a chrome plated precision ground quill, full 4-1/8" diameter. 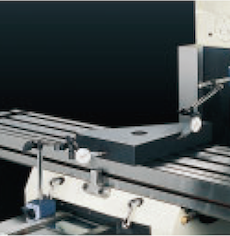 Our mill machine model WM3VS has a rounded ram and column. 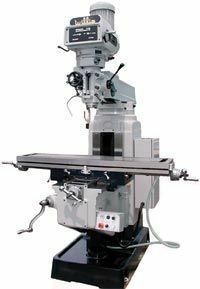 The knee mill models 1050, 1050II, and 1250II have heavy duty square rams and columns with substantial knees and saddles. These mill machines all maintain “Meehanite” castings with hardened and ground ways as well as “Turcite” coating the adjacent surfaces. 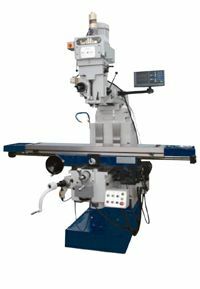 Willis conventional mill machine models WM3VS through 1250II are optionally available with electronic variable speed, through a “Yaskawa” inverter, known as the “EV” (electronic variable) models. 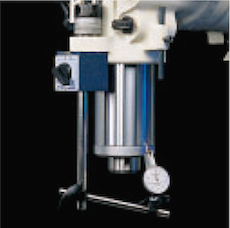 The electronic variable speed option provides these vertical knee mills with up to 5000RPM in spindle speeds. 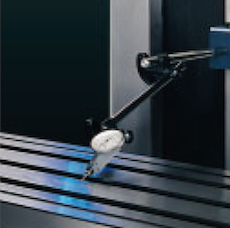 “EV” spindle speeds are infinitely adjustable through a potentiometer. 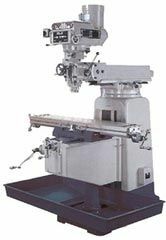 The vertical knee mill models WM3VS through 1250II are supplied both as conventional mill machines and CNC mill machines. 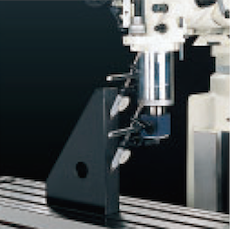 The 1250II head is designed for extra rigidity, with right to left tilt, but without a front to back knuckle. Dynamically balanced pulley with special bronze key attached with 2 screws prevents premature breakage. 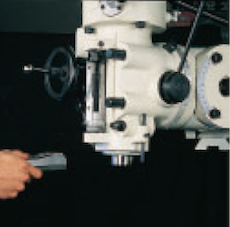 Our standard spring type micrometer adjusting nut provides quick and easy movement for setting spindle depth. 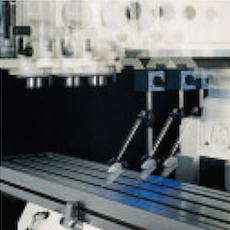 Our special power down feed parts are so strong, they can be used over 3,000 RPM spindle speeds. Our 1 piece cluster gear is superior to the much used 3 piece design. Our design uses splined shafts which are much stronger and more rigid than the keyed shafts. Heavy duty knee with box ways provide the rigidity needed for superb support over the full range of travels. 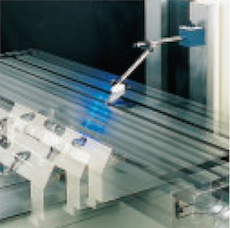 1050II and 1250II tables are capable of supporting loads from 1,100 – 1,500lbs, respectively. Stiffness of Head and Quill Combination.